It’s summer berry pie time! 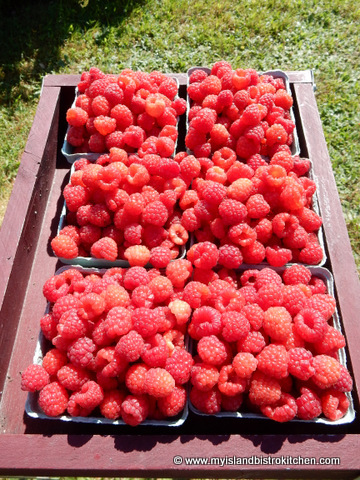 As I write this post in August, the raspberries are in full swing on Prince Edward Island so today’s posting is all about raspberries! 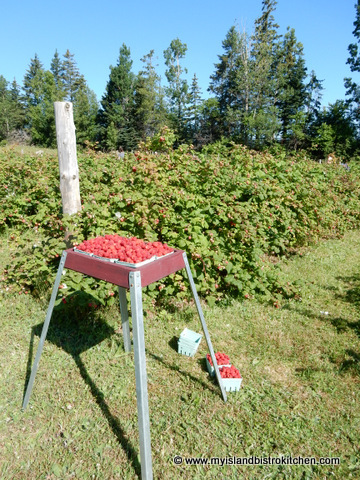 I never mind picking raspberries because there is no bending or crouching involved so it’s not hard on the legs or back. These glorious and perfectly-shaped tasty red berries are versatile and can be used in many ways. 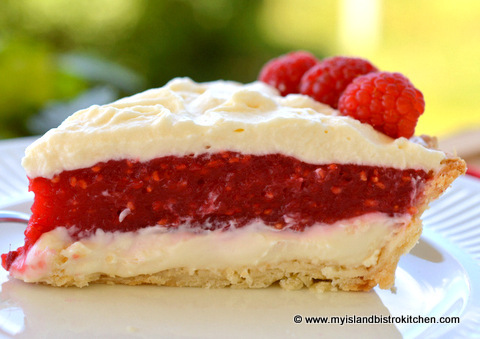 One of my favorite ways to use raspberries is in a raspberry cream cheese pie. It’s a cross between a pie and a cheesecake – the best of both worlds. 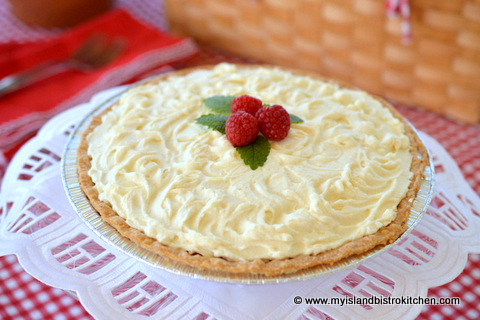 This pie is not difficult to make although it does take a bit of time. It’s also the type of pie that is best eaten the day it is made. I like to use the real whipping cream for the topping but Cool Whip works just fine, too. 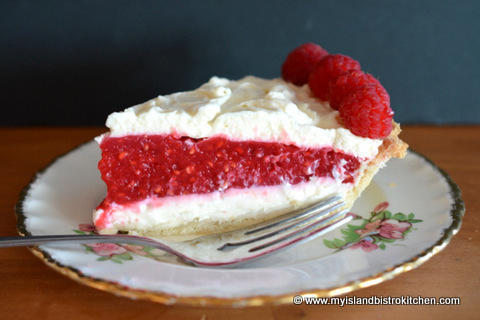 Sometimes, I like to just pipe the whipped cream around the outer edge of the pie because it allows the rich red raspberry filling to show which, of course, doesn’t happen if the entire top of the pie is completely covered in whipped cream. Alternatively, I sometimes don’t put any whipped cream on the pie top, preferring instead to simply drop a dollop of whipped cream on each pie serving as it is plated. Any of the three versions works just fine. In small bowl, beat the cream cheese, sugar, milk, and vanilla. Spread over bottom of pie shell. Refrigerate for at least one hour. In small bowl, combine the cornstarch, sugar, and salt together. 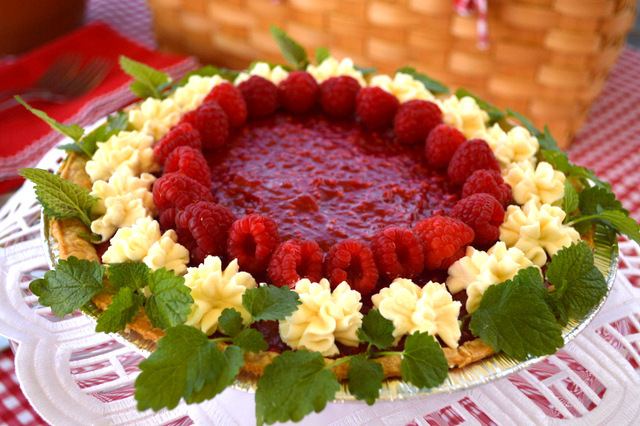 In medium-sized saucepan, combine the raspberries, pineapple juice, lemon juice, and cornstarch-sugar mixture. Cook and stir over medium-low heat until mixture is thickened. Remove from heat and stir in the butter. Let mixture cool to room temperature then spread over chilled cream cheese base. 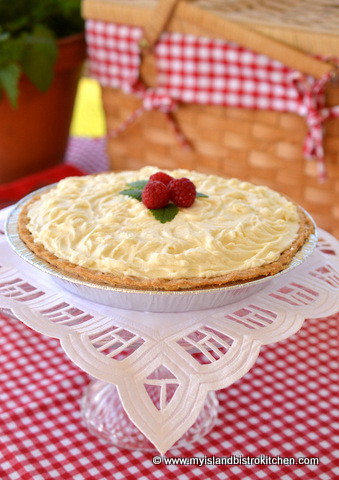 Refrigerate for at least one hour to allow pie to set. 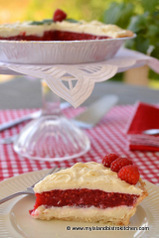 A delectable and flavorful raspberry pie with a layer of cream cheese and a topping of whipped cream. Always a showstopper.